1000 Hills Chef School | Huletts Sweet Young Chef of 2017: Nhlakanipho Sgazo Ngubane. Huletts Sweet Young Chef of 2017: Nhlakanipho Sgazo Ngubane. Huletts Sweet Young Chef of 2017: our own Nhlakanipho “Sgazo” Ngubane. Turning up the heat in 2017. 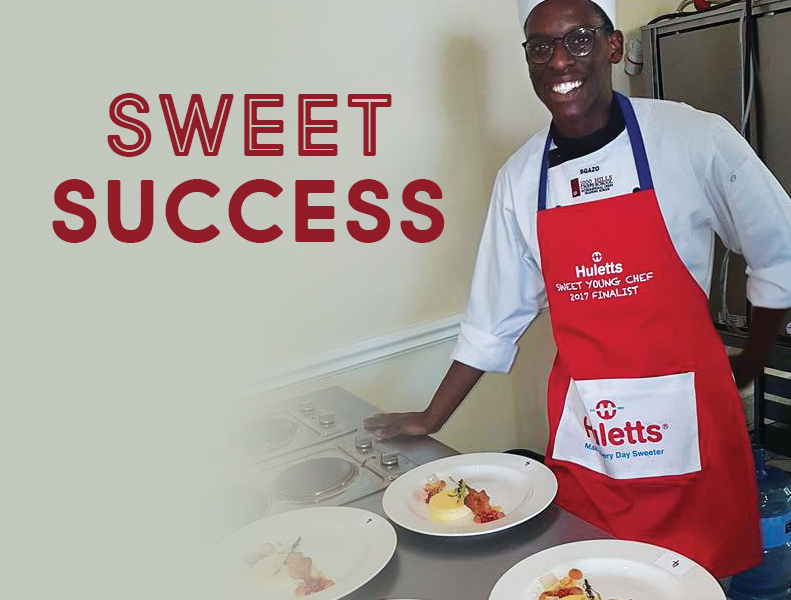 Each year, culinary students from around South Africa compete in the much anticipated Huletts Sweet Young Chef competition. Budding chefs are challenged to submit a divine dessert recipe, using several products from the Huletts range. This year’s winner is our very own talented Nhlakanipho “Sgazo” Ngubane! Held in Johannesburg on 12 August, the 2017 competition was taken up a notch. Four finalists competed in a final cook-off at Infochef, the SACA (South African Chefs Association) annual networking event for young chefs. WACS (World Association of Chef Societies) and SACA-accredited judges to world standards judged the competition. Among three other young finalists, Sgazo had the great opportunity to showcase his winning dish. SACA judges watched as the young culinary artists prepared their dishes. With only two and a half hours to prepare the dishes, the pressure was on. Chef Coo Pillay (Kitchen Judge and Executive Chef) had very positive feedback for Sgazo. An unfortunate mishap during the competition meant that a major component of his dessert was damaged, accidentally. In what Chef Coo described as the calmest response he has even seen in a competition, Sgazo simply collected his equipment, told everyone else not to worry, and re-made the panna cotta. His 1000 Hills Chef School family is incredibly proud of Sgazo for his winning attitude and his well-deserved success. It is especially rewarding as his Advanced studies would not have been possible without the support of FNB Business Banking, who very kindly sponsored his ongoing studies and offered full bursaries to three other Advanced Diploma students. We are so grateful for their support in investing in young chefs’ dreams. You can see just how excited we were to hear the news here. Our very own award-winning young chef. As the only young man competing against three young ladies – travelling from Limpopo, Pretoria and Johannesburg respectively – Sgazo was proud to be selected for the finals of the coveted competition. Sgazo recognises his training, explaining that the industry-like environment and the amount of culinary knowledge learned while at 1000 Hills Chef School prepared him well for the competition. Sgazo really tapped into his love and passion for food during this competition. The creative challenge of coming up with a dessert that truly showcased his skills in the kitchen had him in his element. The added pressure of competition was intense, but Sgazo looked at this pressure as practice for his future in the industry. He dreams of being a chef at top restaurants around the world and one day bringing his skills back to South Africa to set up his own restaurant. Sgazo was accompanied by our Pastry Lecturer, Chef Shaista Anoop, who placed second in the Huletts competition in 2015. She was thrilled to see his progress and says he worked well under pressure. Nicola van Warmelo, also an Advanced Diploma student at our school, won the competition in 2016, and we are very pleased to boast award-winning students in the culinary industry! Sgazo is a talented young chef and this is a fantastic reflection of his hard work and commitment to his craft. It takes dedication and long hours in the kitchen to reach these goals.